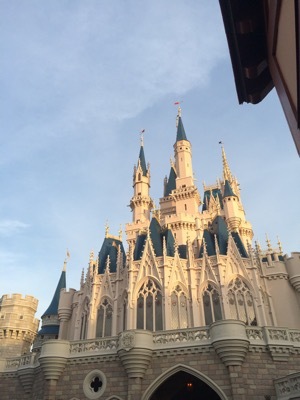 a day of firsts: a meander through Magic Kingdom. 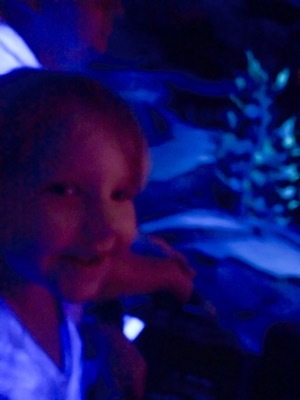 Perhaps it is coincidence that Rheagan and I shared our first Disney experience together. With the exception of several corporate held meetings on property, my eyes have never set sight on the overly animated, theatrical characters of my youth: every hair in perfect position, every eye-shadow magically placed for ultimate effect. 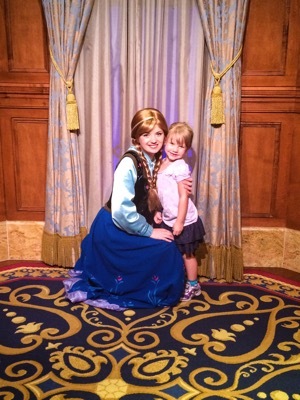 I have never felt the anxious pangs of waiting for my turn with Cinderella, let alone Anna or Elsa or Ariel. The calamity of it all would have been suffocating. Patience, especially at Magic Kingdom, is a virtue. 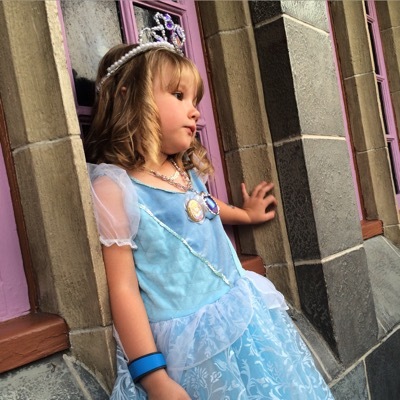 Seeing Cinderella’s castle for the first time, imagining Gus-Gus and Jac-Jac scurrying through the halls, waifs of blue ribbon in their small pointy mouths, I could feel my daughter’s overwhelming desire for lace and tiaras. 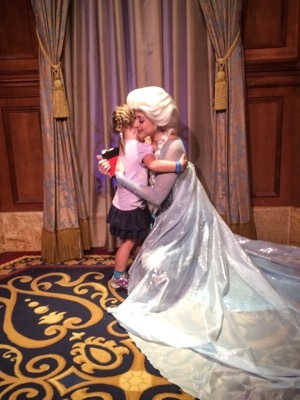 Rhea was especially overcome with happiness at the thought of being in the presence of royalty; as soon as we came upon Princess Fairytale Hall she jumped at the chance to meet Anna and Elsa, and only waited 45 minutes since it was just after opening. Trust me, the line for Main Street Starbucks was longer. The look on her face was ultimately worth it. After cohorting with our Nordic Princess friends, the sommelier convinced her to try a ride on for size. So we meandered through Fantasyland, and soon spotted a cave-like grotto bedazzled with starfish, shells, and sand dollars. We climbed into the family-sized, pink clamshell for our traverse through the ocean underworld. Our little girl’s eyes shone with wonder and anticipation; her yearning for further excitement was born. 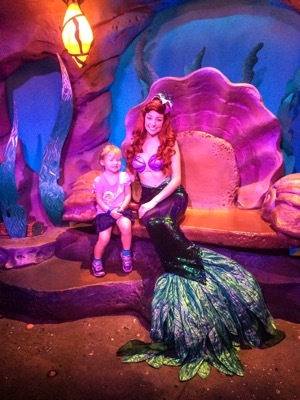 But of course… we couldn’t pass up our first opportunity to see Ariel. After our lunch in Belle’s castle, the skies opened up and the cooling rain began to soak our clothes and soothe our spirits. Luckily, ponchos are always readily available at Disney World, so our family began to blend in with the other wet families meandering through the park. In time, we found ourselves riding carousels, flying boats, and floating through small worlds. 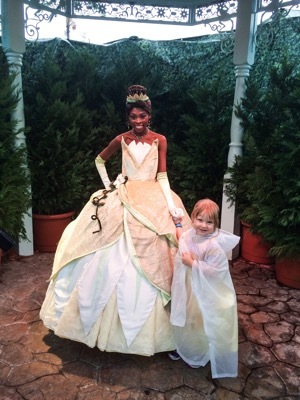 Then… Tiana. And another gumbo lover was born. 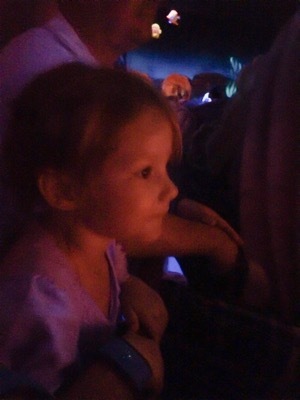 Soon after this… we would learn the true love our four year old princess: roller coasters. While sitting behind her and the sommelier, I could feel the drops and turns of the mine train, and my own excitement for the steel coaster was refreshed. When she exited her first roller coaster ride, she said, “Mommy I screamed, it was so fun! Let’s do it again!” …and then our true adventure began. Thunder Mountains, Barnstormers, and Splash Mountains: she couldn’t get enough. 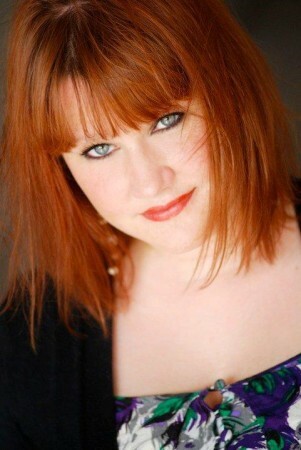 She loved the thrill of it all. In the the early evening, we carried her back to the hotel for a long nap before dinner. Sweet dreams, our roller coaster princess. Tomorrow is another big day of firsts.